Historical Instruments. From ancient times, mariners at sea used the stars to guide them on their long ocean voyages. This is known as celestial navigation. Their astronomical observations were not just a convenience to help mark the months of the year. Knowledge of celestial movements made navigation during long sea voyages possible. Celestial navigation was still used in the last century until radio position systems such as Loran and the Global Positioning System (GPS) became available. Ancient mariners used the astrolabe to measure the elevation of celestial bodies. 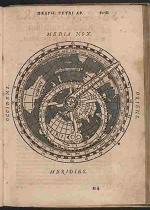 An illustration of an astrolabe appears in the page shown at left, from Cosmographia, by Petri Apianus, 1564, from a collection in the U.S. Library of Congress. Later, the more accurate sextant came into use. Those who knew of the compass could use it to travel in a general direction. Because the earth rotates through 360 degrees of longitude (east-west position on the globe), sailors could determine their exact longitude from the stars if they knew where the star should appear at a given longitude at a given time. By the Renaissance, sailors had accurate tables of stellar positions. They just needed accurate timepieces to determine their longitude. Ultra-accurate timepieces made for ships were developed and known as regulators. Once these regulators came into widespread use in the 1800s, sailors were able to determine their longitude at sea with great accuracy. This allowed them to estimate the time remaining for a journey.